Home Costs > Pool > How Much Does Acid Washing a Pool Cost? How Much Does Acid Washing a Pool Cost? Acid washing is a process that cleans calcium deposits, stains and algae. Over a pool’s lifetime, it is recommended acid washing is done at least three times. Most experts will recommend you get it done when stains are highly noticeable and your typical cleaner doesn’t do the job. 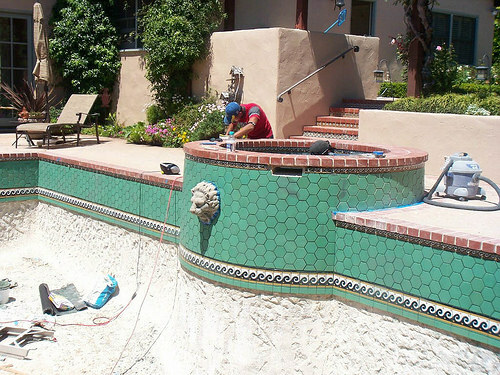 During the process, the contractor will remove the thin layer of pool plaster, revealing a fresh surface underneath. On average, most pool services will have to drain your pool, acid wash it, followed by applying the final chemicals. For an average pool, the price will vary anywhere from $400 to $900 for the average 12,000-gallon pool. The costs will depend on your geographical location, the company you’re using and the size of your pool. In a colder climate, such as New Jersey, residents have stated they paid an average of anywhere from $500 to $700 per session. Bright and Clear Pool Services, a company we found in Arizona, for example, starts their acid washing services at $249, according to the official price sheet located on its website. For example, a member in Arizona had paid $650 to have a 12,000-gallon pool drained and acid washed. Any professional service is going to drain the pool for you, supply the chemicals, and sandblast the outer edge of the pool. After the procedure is done, water will be refilled to the appropriate levels. Acid washing is done in order to remove any type of stain and calcium buildup. Once the pool is drained, a special treatment will be used to wash the edges of the pool. This buffer will help make sure the acid doesn’t remove too much of the plaster. Once the acid is removed, any debris left over will be bagged up, thrown out and the pool will be refilled. When the water is back at its normal levels, the chemicals will be added to make it swimmable again. Over time, the average pool will need up to two to three acid washes. During this procedure, a tiny strip of plaster will be removed, revealing an additional layer below it. If this job is done quite often, a replastering job will have to be done. Once the job has been done, a brighter and cleaner finish will be shown. For those who have a jacuzzi, this will usually add anywhere from $50 to $200 on top of the price quoted. Professional companies may charge extra for pools that have hard to clean stains or a job that may require more work than their typical job. It’s best to get a free consultation in your local are. Draining the pool will usually take one to two hours, depending on the size. For those who want to get your hands dirty with a DIY job, PoolCenter.com has a guide to help you along. Call up at least three different contractors. Websites, such as Service Magic, will find contractors in your area. Simply fill out the form and they will email you quotes for free. Ask the current company you’re with to see if they will offer you a discount. Many companies will give you a discount if you have been a long, good standing customer. Always consider going with a pool company since they will have the necessary supplies. While handymen can offer the service, they will charge considerably more. Consider having an acid washing job done first if considering something such as a replastering. Replastering can be a lot more than acid washing.